The Butter Making Song: Use this simple farm activity with a printable song as an opportunity to talk to kids about where their food comes from and how it’s made. Make Me a Monster: Kids will have a blast finishing off the faces of the Halloween characters in these free printable activities for kids. A great activity to encourage visual motor skills and attention to detail. The Little Old Lady Who Was Not Afraid of Anything Cutting Craft: A fun way to practice cutting skills with a printable craft activity that goes right along with a favorite Halloween book! Pick a Pumpkin Fine Motor Activity: Challenge kids’ in-hand manipulation and grasping skills with a fun fall pumpkin picking activity that uses a cute printable pumpkin patch page! Spooky Scavenger Hunt: A fun printable scavenger hunt activity that kids can do together to get ready for Halloween, using their senses to explore the great Halloween decorations in their neighborhood! Comes with a free printable invitation to give to a neighbor! Halloween Charades: With this printable game of Halloween charades, children will be having their very own monster mash in no time! Cranberry Crazy: This fun Thanksgiving gross motor activity with a free printable will have kids up and moving after Thanksgiving dinner! Wikki Stixy Tom: Get your Super Fingers ready for this one! Meet Wikki Stixy Tom….a printable Thanksgiving fine motor activity created from Wikki Stix! This activity makes a great decoration to stick to a window or a wall. Printable Table Setting Game: A great game for a small group. Kids will learn where to put the silverware, cup, and plate as they race to see who can be the first to fill their printable place mat! Holiday Flashlight Walk: A fun winter outdoor activity for kids, this fun printable scavenger hunt is sure to become a tradition in your family! Also comes with a cute printable invitation to invite neighborhood friends along for the fun! Naughty or Nice: This activity with a free printable enforces the kind of behavior that warrants a visit from Santa and points out the kind of behavior that gets you a lump of coal! Snow Dance: Introducing an activity with a book provides great context, giving kids a sense of purpose behind what they’re doing. 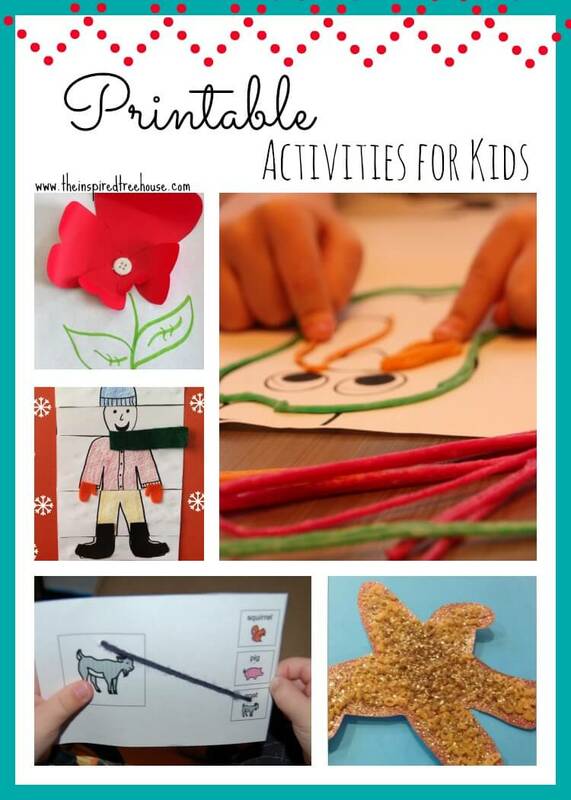 This fun activity with printable pictures is the perfect opporutnity for kids to create some one-of-a-kind dance moves to celebrate winter! Printable Winter Craft: One of our favorite winter crafts for kids because it can be graded to challenge both kids with higher level cutting skills and kids who are just getting the hang of using scissors. Snowy Word Shakeup: While this winter game isn’t necessarily for the youngest kids in the Treehouse, it can be adapted so that anyone can play. How many words can your child find? An Island in the Sun: The book, An Island in the Sun by Stella Blackstone focuses on rhyming, rhythym, and repetition. This post offers two printable activities for kids: a visual memory and sequencing activity and a fine motor craft activity too! Sparkly Sensory Starfish: A fun ocean craft for kids with a free printable template. Get those Super Fingers ready for a fine motor workout! Jumping Hearts: For this activity, we string together a few different gross motor activities that involve jumping – using hearts for our Valentine’s Day theme! Fine Motor Heart Art: There’s nothing better than getting flowers as a gift, especially from a child. Your little one will love making this beautiful flower heart art. And with the added benefit of fine motor skills practice, it’s the gift that keeps on giving! 3D Circus Stars: All kids benefit from fine motor practice with scissors and glue! With these printable activities for kids, your little one will create a 3-dimensional circus star – a clown, a lion, an elephant, or all 3! Snacktime at the Circus! : Step right up and get your popcorn or peanuts! Kids will get to decorate their own fun circus snack holder with this free printable! Bunny Puppet Craft: This printable activity will give your child some fine motor work and some exposure to cutting with scissors as she makes her own puppet that can go “tippy tippy tippy pat, dig scrabble scratch scratch scratch MUNCHA MUNCHA MUNCHA” – just like the book by Candace Fleming! Printable Bedtime Songbook: The bedtime routine wouldn’t be complete without a couple of familiar songs sung by mom or dad! This songbook is a great way of bringing a visual element to some old favorite tunes, making them more interactive and fun. The Bedtime March: When you think about bedtime for kids, the last thing that comes to mind might be gross motor activities. But this one could go a long way toward helping with the whining, pleading, and general slow motion approach that typically goes along with getting young kids into bed. DIY Watermelon Scratch ‘n Sniff Stickers: Printable scratch and sniff stickers with a watermelon scent that could be made even after the warm days of summer fade away! Picnic Drawing Activity: In this activity, we took one of our favorite art projects to use in therapy, visual mirroring, and turned it into a picnic printable – perfect to pack right along with the watermelon and cookies! Sensory Motor Scavenger Hunt: Taking the traditional nature scavenger hunt to a whole new level! This Outdoor Sensory Motor Scavenger Hunt will get kids moving, touching, noticing, and interacting with the outdoors in a totally different way! Transportation Feel and Find Game: In this activity, kids will use their tactile superpowers to figure out which vehicles they’re feeling with their hands without even looking! All About My Mom: Looking for a great gift for a mom? Print out this adorable fill-in-the-blank poem and have kids fill in their answers! Printable Seed Collection Templates: Kids will get to learn about seeds, sorting them by type, size, and color with these cute, colorful printables! Make a Star: Print out the template below to help your child draw a star. Then, read on to get ideas for some creative fine motor practice for your child using his star! 4th of July Poem and Movement Activity: A great way for everyone to experience the fun of fireworks, even if they’re a bit afraid of the real thing – perfect for younger kids or kids who are sensitive to loud sounds. Gross Motor Bingo on the Go! : This gross motor activity can be done on short or long trips, in airports, at the train station, or in the middle of the big city. 3 Fun Clothespin Games for the Car: The suitcases are packed, the luggage rack is loaded, and the cooler is full of snacks for the road…you’re off! And then it happens. “Are we there yet??? ?” And the first bouts of whining and fighting break out in the backseat. You need some entertainment, FAST! Don’t worry – we’ve got your back with today’s road trip activities for kids! Hand Clapping Games: One of the most popular posts from The Inspired Treehouse! Have some fun strolling down memory lane with these fun songs! I Spy With a Twist: Check out these creative ideas for targeting a huge variety of concepts and cognitive skills when you’re playing I Spy in your backyard! W-Sitting Information Handout: Are you a therapist, teacher, or caregiver that works with kids who are W-Sitters? Print off this informational handout to share with parents and families! Baby Bumblebee: This classic kids song gets a little sensory and fine motor twist in this fun activity! Sports Ball Drawing Activity: A fun and challenging drawing exercise where kids have to finish drawing the missing half of a variety of sports balls! Football Pass Route Tracing: Little football fans will love learning the different passing routes by tracing each one! Soccer Fine Motor Challenge: Weave your pencil in and out of the cones for a fun and simple sports-themed fine motor drill!